More The Road than Mad Max, David Michôd’s follow up to the phenomenally successful Animal Kingdom is similarly bleak and violent. Where Animal Kingdom showed us the dark heart of suburbia, The Rover’s post-apocalyptic setting means it’s never as shocking as his first feature, and the sparseness of the narrative may leave some people twiddling their thumbs. We’re first introduced to Eric (Guy Pearce) when his car is stolen. Everyone’s eking out a miserable existence ‘ten years after the collapse’, and Eric’s desperate to retrieve what must be a crucial lifeline in the desolate outback. He soon crosses paths with enigmatic simpleton, Rey (Robert Pattinson), and the two of them take to the road to track down Eric’s car. Michôd isn’t too concerned about audience needs or expectations with The Rover. The film steadfastly refuses to settle into a rhythm, which drove me nuts. Every time it felt like the narrative was building towards something fantastic, it stopped in its tracks. In fact, you could switch around half a dozen of the scenes and it would make very little difference to the narrative. I did enjoy the tone, and this time around at least felt for the characters (something I couldn’t do in Animal Kingdom.) Pattinson finally gives a performance worthy of his box office draw, whilst Pearce is excellent as always. The two of them make for an interesting odd couple, with echoes of George and Lennie from ‘Of Mice and Men’. The film is episodic in nature, which is another thing that works against the pacing. I did enjoy the fact that it didn’t elucidate upon the nature of the apocalypse, and Antony Partos’ score is wonderfully eerie. 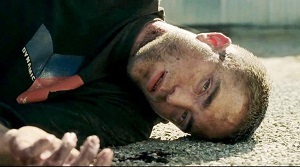 The Rover is so damn sparse that there isn’t really much to recommend. The film’s also predictable, perhaps as a consequence of there not being much going on; I spent the time wondering where the story was headed, rather getting lost within it. Sluggish at regular intervals, this is really only one for the most patient of viewers. The film will definitely find an audience, but the fact that the trailer woefully misrepresents the film – as happened with The Road too actually – is bound to leave some people angry. The Rover seems to succeed at doing everything it sets out to achieve, but at the end of the day, I could only recommend this to the most ardent of apocalypse movie fans. As for me, I’m hoping the soon-to-be-released These Final Hours is more my cup of tea. This entry was posted in Film Reviews and tagged Drama, Fable, Thriller by Stuart Wilson. Bookmark the permalink.